Al Waha Arabian stud of Haslemere, Surrey, was the second stop on my summer 2000 stud tour. Al Waha, which means ‘the oasis,’ is owned by Jane Kadri. After a pleasant journey south from London, I drove along a very narrow, tree engulfed, lane to arrive at the farm gate. Since Jane lives most of the year in Abu Dhabi, I did not expect her at the farm. Instead, I expected to be greeted by either Kathy Etherington, Jane’s office manager, or her stud manager, Ronnie Booth. However, to my very happy surprise, I was greeted by Jane Kadri herself. I was extremely delighted to have the opportunity to meet Jane and get acquainted. Al Waha Arabian stud has been in existence since 1982, and presently manages over 60 head of horses. Of these, 18 are Crabbet or Old English, all of the eighteen listed in the GSB directory. The remaining horses, except for ten straight Russians, are of Russian/GSB bloodlines. In researching Jane’s horses, I found a quote from Jane’s website very informative: “During those early years, I read every recommended Arabian horse book I could find, went to shows, visited farms, asked a million questions, and listened to hundreds of opinions on the best bloodlines and where the best Arabian horses could be found.” (see the Al Waha website at http://www.waha.co/ ) Jane certainly has done her research. 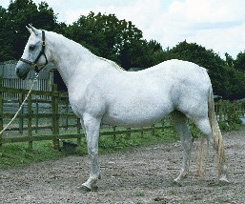 Jane originally chose mares of English bloodlines as a foundation for Al Waha Stud, purchasing Royal Destiny (Ringing Gold x Risanira), Dancing Queen (Dancing King x Ludmilla), Dancing Dream (Dancing King x Dargemet), Maysuna (Haroun x Mandahyla), and a young filly, Ivory Wings (Silver Blue x Silent Dove). Jane began her breeding program using English blood and then infused her program with purchases of Russian Arabians. She is breeding her horses for taller, athletic individuals with extreme good movement, quality and style. Horses of her breeding program have experienced success in the show ring and on the race track. Currently Al Waha still maintains the bloodline pools of both English and Russian. In this way Jane can breed either group straight, or crossed onto each other. At the stud, I was shown primarily horses of the Crabbet/OE lines, and (to conserve time) several of the Russian horses, and the resulting crosses. What follows are my impressions of some of the Al Waha stock in order of their presentation. DAAS (Imad x Dancing Queen by Dancing King) is a beautiful, refined, typy, well balanced and correct six-year-old chestnut stallion. 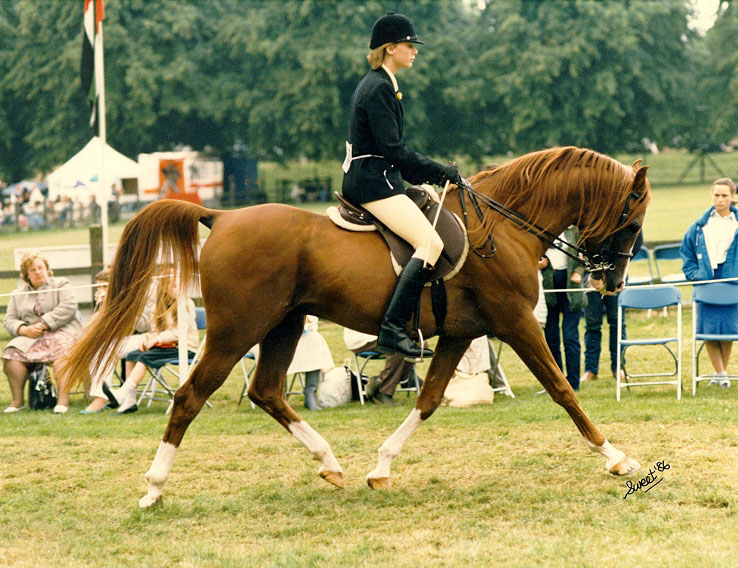 His sire, Imad, was also bred by Al Waha, and as mentioned in my stud tour article on Coed-y-foel, Imad has achieved enormous success as a performance horse. Daas has not been shown much, but as a yearling, he won his halter class at the Bath and West show. DIFLA is his five-year-old full sister. She possesses a typy, dished, feminine head and athletic body. MATEENA (Daas x Mania) is a chestnut three-year-old half-Russian mare. Mateena is certainly built for running, high withers, long neck and good limbs. I liked the gray Russian stallion NARIM (Moment x Nejnaia by Nabeg) who is now 20. 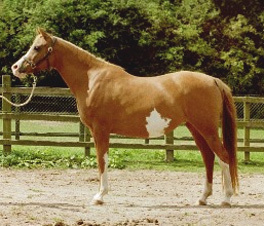 He was purchased from Tersk in 1985 as a five-year-old for $45,000. He is a race winner with an impeccable pedigree. 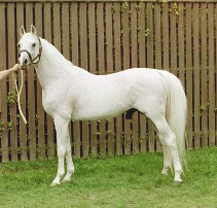 His dam is a daughter of the well known Nariadnaia and his sire Moment, a son of Salon, from the Naseem sire line. Narim shows the exquisite refinement of this bloodline. He has a very typy head, large black eyes, pretty tiny ears, graceful neck and superb shoulder and hips. His alert expression made him even more handsome. He is known for his extreme movement. PALUBNIK (Balaton x Pesnianka by Nabeg) is a 1990 stallion on lease from Sheikh Mohamed bin Rashid Al Maktoum. He is very athletic looking, short coupled, with good legs with a short masculine Arabian head. He is the ‘follower’ (second string stallion) for Narim in the stallion barn. I was surprised to see the 1982 chestnut Courthouse stallion SPEARMINT (Shammar x Sappho), one of very few all Courthouse Arabians around. Seeing him may not be exciting for most English breeders who are used to seeing Courthouse breeding, however, we in the U.S. have very little of the Courthouse lines. He is of an older style, a bit smaller in size as Mr. Musgrave Clark had strong feelings about size when it came to Arabians. Spearmint has a pretty head, good limbs and joints, noticeably good feet, and he is well balanced overall. He has the ‘Arabian type’ written all over him. Since Bill Musgrave Clark was a staunch supporter of using his horses in endurance tests, it is little wonder that Jane has Spearmint to supplement athletic qualities of both the Crabbet and Russian lines. A young and very promising yearling was shown next. He is the chestnut TOMAN (Grand x Queens Topaz). 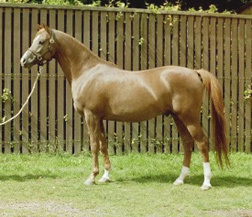 TOMAN as a yearling has a lovely smooth, strongly coupled body, correct limbs, a good length of neck, good angle to his shoulder, and a typy head. None of my photos do him justice, but he is one to watch for the future. Grand, his sire, was bred at Tersk Stud and is by Mukomol x Nevesta by Aswan. Al Waha’s stud manager, Ronnie Booth, has a long history with horses of many breeds including Arabians. Prior to her position at Al Waha, Ronnie worked for Mr. Michael Pitt-Rivers at Tollard Park Arabian Stud. There he stood the Australian stallion Ralvon Elijah, and had a well known English breeding program that did very well in the show ring. She is a delightful, down-to-earth woman and a pleasure to meet. She gladly spent her entire time showing me all these horses. For the broodmares, the first shown was 12-year-old TAMIRA (Andoy x Queens Topaz). Tamira happens to be rather noticeable as she has a large white belly spot shaped like a Canadian maple leaf. She is a pretty mare and very correct. Tamira was Futurity Champion and Best 3 Year Old Filly of her year. Then was the 1981 gray foundation mare IVORY WINGS (Silver Blue x Silent Dove), the dam of the successful Imad, who was her first foal. Jane has had Ivory Wings since she was nine months old, and at the age of 19, her back is beginning to drop. She has a lovely feminine face and expressive eyes and ears. 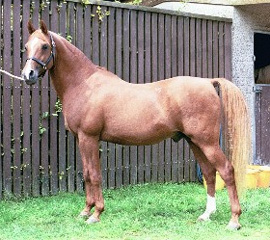 QUEENS TOPAZ is a lovely 1980 chestnut mare by Midnight Gold x Dancing Queen. She is the dam of the belly spotted TAMIRA. Queens Topaz has minimal white, is well balanced with a pretty face and flaxen mane. Some of the other broodmares I saw were MARIKA, a flaxen maned 1980 chestnut mare by Haroun out of Aurelia; MURJANA, a 1992 gray mare by Star Lightning x Maysuna by Haroun; DALLUA, a 1985 flaxen maned chestnut mare by King Cotton Gold x Dancing Queen; the 1975 chestnut foundation mare DANCING QUEEN by Dancing King x Ludmilla, dam of DAAS, DIFLA, DAHISHA, DALEELA, QUEENS TOPAZ and DALLUA, all present at Al Waha. Younger mares that were shown included Dancing Queen’s 1991 gray daughter DAHISHA (full sibling to DAAS), who was Reserve Champion at the Northern Show as a yearling and looks to make a good riding mare; the gray 1990 mare LAMEES by General Lee Gold x Pearl of Destiny; DEEMA, a gray 1989 mare by Mamluk (Aswan x Monogramma) x Dancing Dream; and the dark gray 1998 filly MOUSIKA by Daas x Maysuna, who has a very pretty typy head. I’m sure I was shown more mares than this, but only list the mares for which I have photos. Many of these mares are not currently being bred. A visit to Al Waha is very highly recommended not only because of the fine collection of rare older English bloodlines, but the cross of these lines with Russian can be a valuable learning tool for anyone considering this outcross. The Russian lines have been known to add type, height, reach, and movement. The marketability of Russian horses is one strong suit to breeding into these lines, if one does their homework and markets wisely. You won’t easily find any more knowledgeable and discerning breeder than Jane Kadri. She has successfully gone her way with her foundation lines, and decidedly proven her breeding decisions, as well as purchases, in the show ring and in performance venues. Jane is dedicated to the Arabian horse, has attended and worked many of the AHS shows, is highly respected and is very much on top of what goes on in the Arabian world. Although I did not take the space here to mention the beautiful grounds and stabling facilities, you can read more about Al Waha in further detail on their website mentioned above. I certainly would enjoy a return visit to see the remaining horses I missed, and to carry on more interesting discussions with Jane, Ronnie and Kathy. Jane has imported, on generous loan from the Royal stables, Abu Dhabi, the 18 year old stallion ABOUD ( Diamond Star x Azeme Bint Gleam) who arrived at Al Waha in mid-February this year. 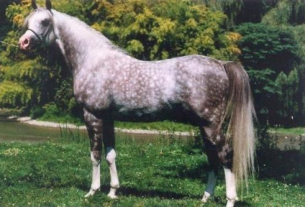 His bloodlines are very rare and trace entirely to horses registered in the General Stud Book. He has been an outstanding sire both in England before his export and in Abu Dhabi where he has 7 breeding daughters in the broodmare band. He has sired both U.K., Jordan and Qatar champions.